Climate Action Now and its allies support the legislature in attempting to act on solar energy in 2015 prior to taking up a more complex omnibus energy bill in 2016. However, H.3854 as written would impede progress in reducing global warming emissions by restricting the growth of solar, and would weaken the solar industry, resulting in a loss of jobs and tax revenue. Therefore we ask legislators to carefully consider the following points and to notify the conference committee – Representatives Dempsey, Golden, and Brad Jones; Senators Downing, Tarr and Pacheco; as well as Speaker DeLeo and Senate President Rosenberg, of the need to incorporate these changes to the final compromise. Eliminate the cap on solar energy net metering*. Rationale: Already the existing cap is having an adverse impact on 175 affected communities by preventing them from saving on their electricity costs, and the state is losing jobs and tax revenue by reining in the solar industry. Raising the cap slightly (by the proposed 2% in H. 3854) will only allow a portion of planned projects to be completed before the new cap is reached, likely in six months. At that point, new legislation would be required to raise the cap yet again. Eliminating the cap would give solar businesses the long-term assurance they need to maintain and grow their workforce, providing jobs and tax revenue. It would also enable municipalities to pursue solar arrays to achieve their greenhouse gas reduction goals and cost savings, and encourage low-income and community shared solar projects, helping expand renewable energy in an equitable manner. Maintain the current retail reimbursement rate for net metering until comprehensive study of the issue is completed. Rationale: Slashing the reimbursement rate from retail to wholesale for sizeable arrays will make them less likely to be built, as the return on investment will be drastically reduced. H.3854 cuts the reimbursement rate by 75%. Municipal, low-income and shared community arrays require the retail reimbursement rate for financial viability. If a cut in the cost of solar to utilities is found to be necessary (see point 5 below), the Solar Renewable Energy Credit (SREC**) incentive program can be modified without harming municipal low-income, or community solar projects (see point 6 below). Do not allow utility companies to impose a mandatory monthly minimum charge as stipulated in H.3854. Rationale: Mandatory minimum charges would discourage energy conservation by raising costs for low-energy users, and discourage investment in solar arrays. As worded, H.3854 could result in annual minimum charges of $360 for residential solar customers and significantly higher bills for businesses and municipalities, negating much of their investment in solar. If any such charge is considered, it should be informed by an actual study of the benefits and costs of solar energy, and limited to a reasonable fee. Grandfather all solar projects so that their reimbursement rate remains as agreed upon when they were built. Rationale: Transitioning to lower reimbursement mid-stream (in 20 years as stipulated in H.3854) fails to honor agreements made when project costs were calculated, undermining confidence in doing business in Massachusetts. This would have a chilling effect on new projects that require long-term payback. Initiate a transparent process to study the actual costs and benefits of solar to guide long-term policy. Rationale: The inaccurate and misleading claims of the utility industry about the cost of solar need to be independently evaluated. The considerable benefits of solar must be factored into the equation. Prior analyses have shown that the actual benefits of solar outweigh its costs, for example by eliminating the need for more power plants, reducing pollution from burning fossil fuels and offering protection from unpredictable fluctuation in the price of fossil fuels. Rationale: The SREC program accounts for the majority of solar costs to utilities and can be reduced without tinkering with the proven worth of net metering reimbursement. Adjusting the SREC program would be more equitable for low-income communities that are not eligible for SRECs but depend on net metering reimbursement, and for other solar users who do not own their arrays. The Dep’t of Energy Resources (DOER) can examine and adjust the SREC program. *Solar net metering refers to the program that reimburses solar customers for the excess power they generate and provide to the grid. This is a CRUCIAL time for Massachusetts legislation. Though we have passed the deadline for co-sponsoring House bills, legislators can sign on to Senate bills up until the time of hearing. Ask your legislators to sign on to the Senate bills endorsed by CAN NOW. 1. Find the contact information for your legislators. Simply enter your zip code. 2. Send a letter, including the list of the bills CAN endorses. Letters are always better than emails. Add a personal note. Copy and paste the following section for your email. Use this subject line: Urgent – Need your co-sponsorship on these climate bills this week! Thank you very much for your past support for climate action. Climate change is accelerating faster than ever expected and our window to act is rapidly closing. With back-stepping by the federal government, it is all the more urgent that states like ours take definitive leadership on making the transition to clean, renewable energy and decreasing fossil fuel emissions. We need you to help mobilize the Massachusetts legislature to meet these challenges. I ask you to act swiftly to co-sponsor the climate bills in this package. I ask that you personally take a leadership role in putting climate related issues front and center. I ask you to act swiftly to co-sponsor the climate bills in this package. Getting the whole package enacted will require legislators to not only co-sponsor the bills but actively work to get them enacted. Climate Action Now will be rating legislators this session to allow constituents to see how strongly their legislators support the bills in our legislative package. As my legislator, I hope you will be one of those who will get an A+. 4. Make a phone call to follow up on your letter and email. BONUS: Amplify! Personally ask a friend in another part of the state to do this. Forward this page to them. State action on climate is all-important now. Thank you for TAKING ACTION! Together, we are unstoppable. We need to call our representatives early and often starting NOW, to let them know that climate must be a top priority. While Climate Action NOW appreciates the time and effort the legislature has devoted to the issue of solar policy in the last months, we have significant concerns with the final bill, H.4173, that passed this week. While the bill raised the net metering cap a bit, continuing with a cap at all is counterproductive to sufficiently reduce our fossil fuel use in combating climate change, and arbitrary cuts to net metering compensation will harm low-income solar projects and projects already in the queue awaiting the raising of the cap. Other states such as California and New York have decided to continue with full retail net metering and to discontinue caps on net metering while they undertake a more complete analysis of the benefits and costs of solar to their communities. Massachusetts should do no less. Cutting the net metering compensation to 60% of the retail rate will significantly harm the development of low income solar projects. While we applaud the legislature for maintaining the retail reimbursement rate for residential customers, we are deeply troubled by the juxtaposition of these two rates. Essentially, the bill offers wealthy and middle class solar homeowners a higher net metering credit than it offers low-income solar customers- for the same amount of energy supplied to the grid. We do not believe the conferees intended to exacerbate economic inequality, but that is the unintended consequence . Furthermore, by suggesting that DOER can rectify this inequality via the SREC incentive program, the bill displays a fundamental lack of understanding about low-income benefits. Low-income residents cannot accept cash compensation (such as through SRECs) without compromising their eligibility for service and support programs they rely on. Furthermore, facilitating the ability of the electric utilities to petition the DPU for mandatory minimum charges for solar customers without specifying a ceiling, or an exemption for low-income customers, will add a burden equivalent to a tax on all consumers that will especially harm low-income users. Projects already in the queue were planned, financed and approved based on the prevailing retail net metering rate at the time of their development. To retroactively change that anticipated compensation would jeopardize these projects and give Massachusetts a bad reputation among clean energy developers who will have no reason to trust policy stipulations at any point in time. Eliminate the cap on net metering, given the significant cuts to net metering credit values. Restore full retail net metering for low-income solar projects. Specify that if DPU ultimately approves a mandatory minimum charge for solar customers, that charge cannot exceed $10 a month and low-income solar customers must be exempted from it. Exempt solar projects already in the queue from the reduced net metering rates. The future of the solar industry hangs in the balance and we need to make sure that our legislators hear from us! Please take action now by clicking on this link and filling in your zip code at the bottom of the page. That will allow you to automatically send a strong solar message to your legislators. Please circulate this link to everyone you know in Massachusetts so we can generate thousands of messages to demonstrate our strength. Why the urgency? A bill is currently in conference committee (H.3854) that would severely limit the growth of solar electricity in Massachusetts. It would slash net metering reimbursement by 75% for big projects like municipal and community shared solar, would raise the net metering cap by only 2% (likely to be reached within 6 months) and add a new mandatory minimum charge on solar owners.What would be the impact? Most big upcoming projects will be abandoned, and solar jobs and tax revenue will be lost. Low-income residents and municipalities would be hurt most because projects for apartment buildings, community shared solar, and municipalities would never be built. Many homeowners would abandon solar plans because the monthly minimum charge would reduce the value of going solar. To read the most recent update on the solar impasse go here. 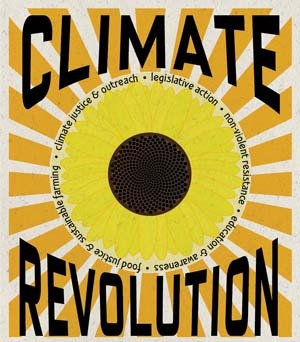 Check out the Climate Action Now/Mass Power Forward statement here. Act now to save solar! Currently in Conference Committee at the State House the future of the solar industry hangs in the balance. H.3854 was passed overwhelmingly by the House at the end of November- Representatives apparently did not appreciate how devastating the bill would be for our solar energy future. barely enough to last until summer, and not enough to continue planning large projects in areas affected by the cap. Projects in the planning stage, such as municipal arrays on capped landfills, could not proceed. projects. This reduction in reimbursement for excess electricity provided to the grid will eliminate the financial justification for undertaking these projects in the first place— substantial cost saving for municipalities, and low-income residents. 3. H.3854 allows the utility companies to initiate a new mandatory minimum charge for solar owners. This would further reduce the incentive for homeowners, municipalities and communities to pursue solar. These changes will destroy solar industry jobs in Massachusetts (layoffs are already occurring) and halt our progress towards replacing polluting electricity with green electricity. We need to eliminate or substantially raise the net metering cap until a longterm solar strategy is developed. We need to continue reimbursing for excess electricity at the retail rate, and not allow mandatory minimum charges, at least until a full, fair and transparent evaluation is undertaken in public, and justification for these drastic actions is clearly demonstrated. necessary, the SREC program is preferable for modification, as that program accounts for most of the costs, and would have the minimum negative impact on municipalities, low-income and community solar projects. Climate Action Now is calling on our elected state officials to take bold and decisive action by supporting a solar net metering bill that promotes jobs, increases tax revenue, and encourages renewable energy production in Massachusetts. The bills being considered in conference committee right now will severely limit the growth of solar energy. They are especially unfair to low-income residents and municipalities because larger projects like those for apartment buildings, community solar, and municipalities stand far less chance of ever being built. These bills would crush a thriving solar industry, which employs 15,000 people in the state and adds about 3,000 new jobs per year. Our state has been a leader in solar, and we need to continue to encourage its growth. Go here to read a statement by Climate Action Now on this issue. As part of the Mass Power Forward Coalition we urge you to take action now by going here to send a message to your state legislators. prior to taking up a more complex omnibus energy bill in 2016.
need to incorporate these changes to the final compromise. 1. Eliminate the cap on solar energy net metering*. revenue by reining in the solar industry. Raising the cap slightly (by the proposed 2% in H.
study of the issue is completed. projects (see point 6 below). solar energy, and limited to a reasonable fee. upon when they were built. projects that require long-term payback. fuels and offering protection from unpredictable fluctuation in the price of fossil fuels. they generate and provide to the grid. Legislative ACTION ALERT for Wednesday morning. OK, unfortunately the anti-solar bill passed in the house. SENATE IS VOTING TODAY. Please call your state senators today and urge them to vote AGAINST S.1979. Call or email your senator right now. We have heard from our Boston reps that once they hear from just 6 people, they know they have to pay attention. The Massachusetts House passed a solar energy bill (H.3854/S.1979) tonight that will effectively eliminate the Massachusetts solar industry. It is now up to the Senate to suggest an alternate path that will support a vibrant solar economy. MassSolar strongly opposes this legislation passed by the House and is working with legislators in the House and Senate to develop alternative solar policies that would foster the long-term, vibrant growth of solar in the Commonwealth. We’d ask you to contact your state senators first thing on Wednesday morning to let them know that you oppose passage of S.1979 as originally drafted. Ask your Senator to ensure that the problems listed above will be addressed in any legislation passed by the Senate. Your Senators will be voting on this legislation on Wednesday. We can do better. Here is how. The bill would cut the amount solar customers receive for the solar energy they supply to the grid by over 75%, lowering the net metering rate from an average of $0.18 / kWh to $0.04 / kWh. Solar projects simply do not make economic sense in the Commonwealth at those rates. Perhaps even more concerning is the fact that this legislation would retroactively lower the net metering credit rates for existing solar energy installations 75% after the first 15 years of operation. Schools, cities and towns, non-profits and businesses will see the value of their investments slashed as a result. In addition, the legislation would impose a minimum bill on existing and future solar customers whether they install solar on their own roof or buy solar power from a community solar project. So existing solar customers will have the value of their existing investment hurt twice, once by receiving lower rates for the power they produce and then by having to pay higher fees to connect to the grid…all without any justification that these changes are necessary. The net metering task force issued a report that found that every dollar invested in solar resulted in $2.50 of benefits for the Commonwealth at large. They recommended that the administration conduct a value of solar study to determine the fair and proper compensation for both grid operators and solar owners. Once that value of solar study is completed and appropriate compensation is assigned for both costs and benefits to both grid operators and solar owners, there will be no need for implementing minimum bill charges. The Acadia Center has conducted a Massachusetts value of solar study that found solar provides approximately 22 to 28 cents / kWh in value to the grid, which far exceeds the current retail net metering rate. So given that both the net metering task force report and the Acadia Center study have determined that solar benefits far outweigh their costs, we recommend continuing the current very successful programs until a full and complete value of solar study can be completed. The solar industry has had half of their projects put on hold for seven months now since the net metering caps took effect in 171 Massachusetts communities. During that time over 115 MW of solar projects have been added to the wait list, including 12 MW added in the last week alone! At that rate, the proposed 2% net meter cap increase is totally inadequate and will result in solar projects being back on hold as soon as four months from now. The proposed cap increase is too little, too late. Net metering caps should be lifted enough to meet the administration’s 1,600 MW solar targets and to allow enough time to successfully complete our projects before the expiration of the Federal Investment Tax Credit. It is time for our legislators to address the larger issue: until the utility business models are changed to align with our citizens’ goals for the Commonwealth, we will continue to sacrifice the benefits of a renewable energy economy and more resilient distribution grid, including job growth, better health, cleaner air, cleaner water and a more livable climate in favor of utility profit margins. MassSolar recommends that the legislature direct the DOER and DPU to investigate a next-generation profit model for the Investor Owned Utilities that aligns their shareholders’ interests with the evolution of a power grid that is powered by resilient, distributed, clean energy resources like solar. Until our interests are aligned, the IOUs will perceive solar power as a threat to their shareholders and will work to impede the continued success and growth of the clean distributed generation economy in the Commonwealth. URGENT – 11th hour Terrible SOLAR bill – REALLY NEED CALLS RIGHT NOW! Urgent action needed on the solar bill. The House came out with its solar bill last night, and it’s pretty terrible. 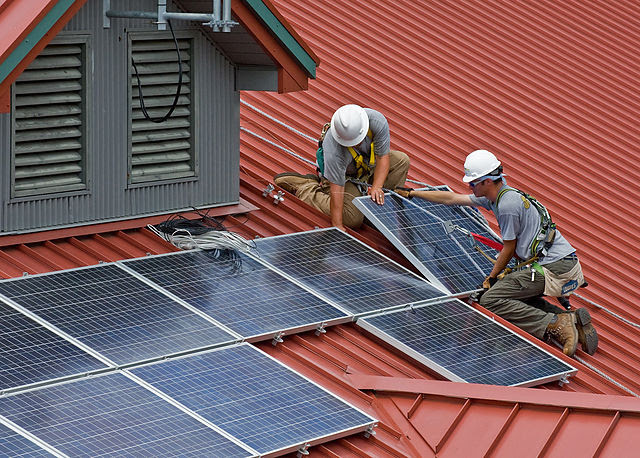 It would make a major, unjustified cut to the compensation for solar energy under net metering, which would make it harder for many types of solar projects to go forward, including projects serving low-income communities, nonprofits, municipalities, and pretty much anyone who can’t put solar panels on the roof of their own house. It would also establish a minimum electric bill for people who have solar. House leadership is trying to cast this bill as a “solution” to the net metering crisis, but it would only make a small increase in the caps (barely enough to carry us through the next few months) while making changes that would stop solar in its tracks beyond that. We need to send a message loud and clear to our reps and senators today that this is not an acceptable solution. We’re asking legislators to strengthen the bill… but if that is not possible, we may have to ask them to kill it rather than have a deeply flawed bill move forward. The Legislature wraps up for the year on Wednesday, so this is our last chance in 2015. Contact your legislators right now and ask them to fight for a better solar bill. The Speaker’s proposal is simply unacceptable. At a time when more and more families are making the switch to clean energy, he wants to slam the brakes on solar. It’s especially outrageous because we just delivered petitions signed by 8,000 Massachusetts residents and letters signed by 1,000 civic and business leaders, urging state officials to expand opportunities for solar power. Back in March, when we hit a limit on the state’s most important solar program, we knew the utility companies would see this as an opportunity to push their selfish, anti-solar agenda. But frankly, I’m surprised they’ve gone this far. The Legislature will finish for the year later this week, so our window of opportunity is small. But with your support, I think we can still get a good solar bill over the finish line. Please contact your legislators today and urge them to expand solar. Hi, my name is ______________ and I’m a constituent of Senator/Representative _____________ from ____________ (town). I’m calling because I want to see more solar power in Massachusetts. That’s why I’m concerned about proposals to slash the compensation for solar energy under net metering, which would make it harder for many families to power their homes with clean energy. I’m also concerned about proposed minimum charges on electric bills. Please support immediate action to lift the net metering caps, and please support changes to proposed solar legislation to preserve the value of net metering credits and to avoid creating minimum bills. Thank you! I support solar power and I want to see Massachusetts get more of its energy from clean, local sources like solar. I believe the state should continue to support solar development. That’s why I’m outraged by proposals to make huge, unjustified cuts to the compensation for solar energy under net metering. These cuts would make it harder for many families to power their homes with clean energy. I’m also concerned about proposed minimum charges on electric bills, which could unfairly penalize solar users. For the sake of our environment and our communities, we need to move as quickly as possible to power our state with 100% clean, renewable energy, and solar has a critical role to play. 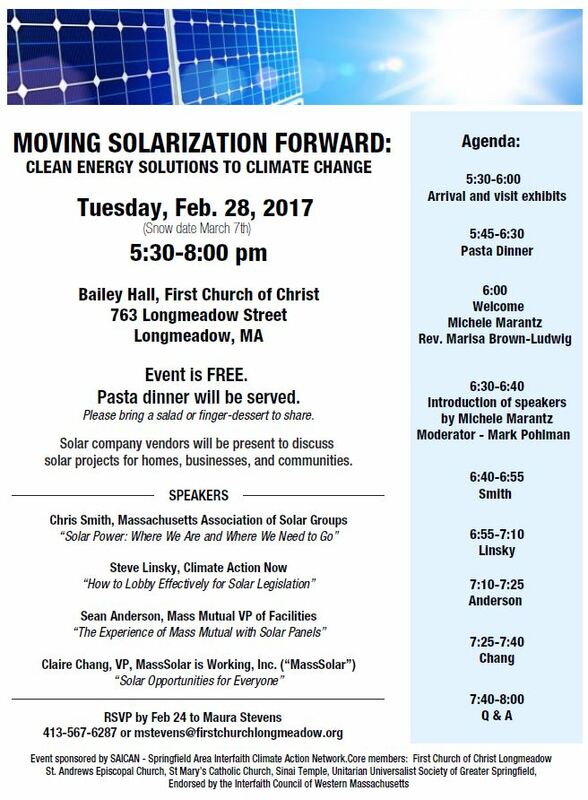 Please listen to the vast majority of Massachusetts residents who support solar power, instead of the utility company lobbyists. And please support changes to proposed solar legislation to ensure that solar can continue to grow rapidly and that its benefits will continue to be available to all.